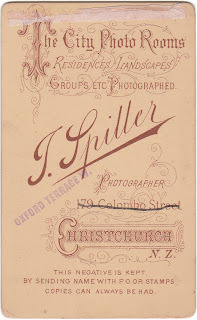 above - a view looking towards Oxford Terrace showing the studio of John Spiller. 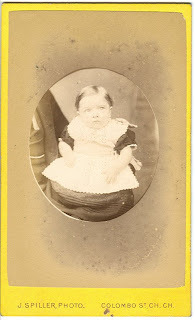 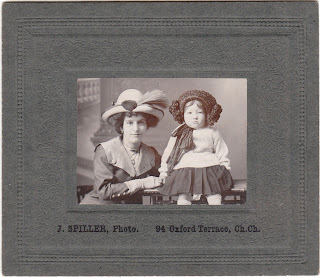 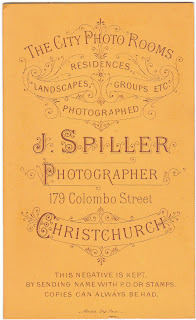 John Spiller (1850 - 21 October 1928) was born in Broadway, Somerset the son of Samuel Spiller, a labourer and Elizabeth Spiller nee Newton. The 1861 census shows the family at Baisleys in Broadway; he was then aged 10 years. 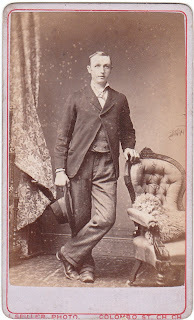 In 1871 he is a boarder at Champford Lane, Wellington, Somerset , the house of Edwin Cox, a railway porter. 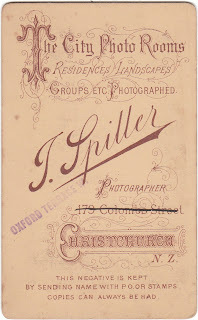 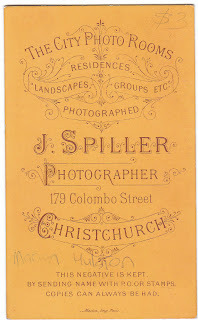 John Spiller is then aged 20 years and employed as a photographer. He then lived for some time at Exeter and later it Tunbridge Wells, Kent. 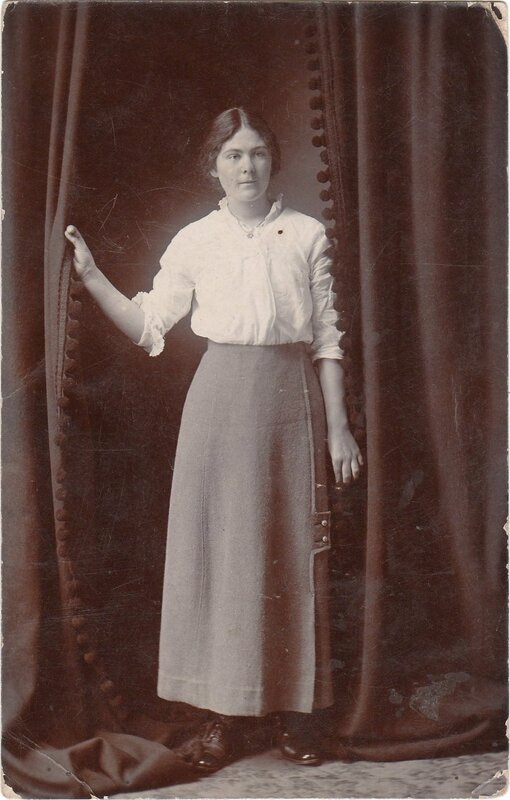 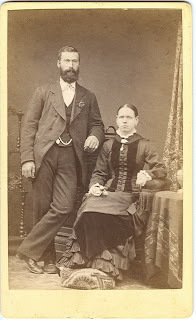 In 1876 at Tunbridge Wells he married Matilda Sophia Hunt (1854-24 July 1933) the daughter of Matilda and Robert Hunt, a Post Office weight's clerk. 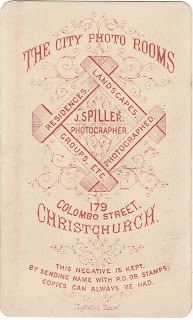 Shortly afterwards they left for New Zealand on the "Waimate" travelling as second cabin passengers. 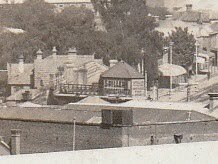 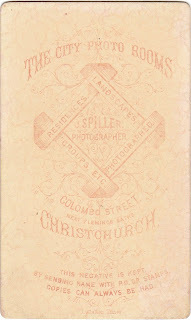 They arrived at Lyttelton on 3 September 1877. 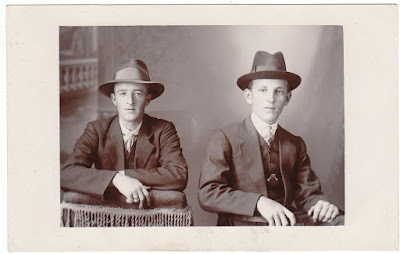 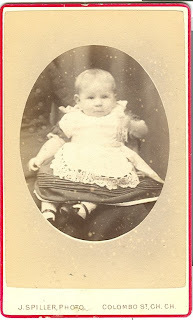 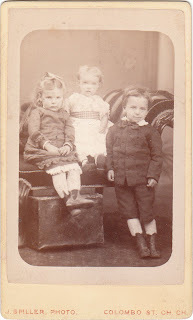 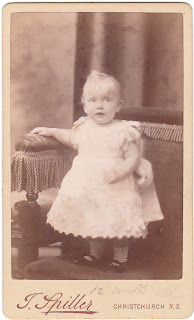 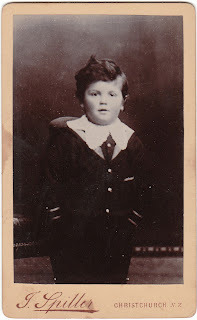 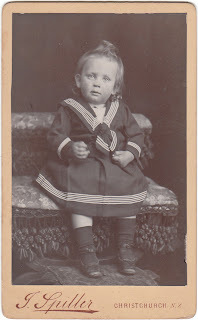 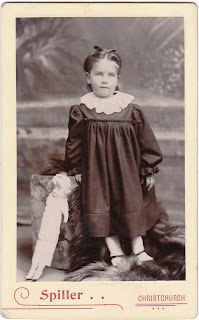 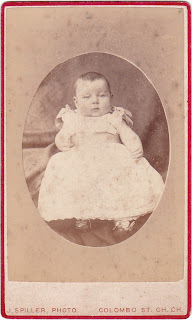 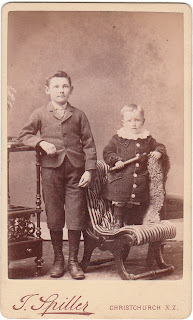 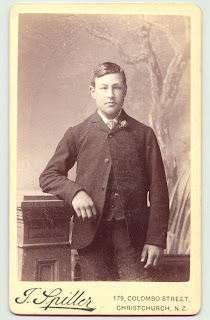 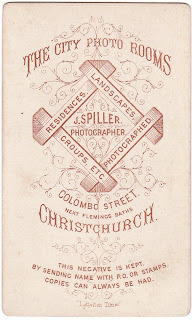 There were four known children born in New Zealand - Harry Spiller born circa 1878, Walter Spiller born circa 1879, Bertram Spiller born circa 1880 and Leonard Spiller born circa 1883. 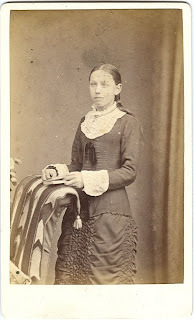 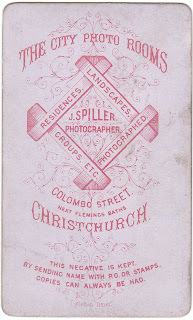 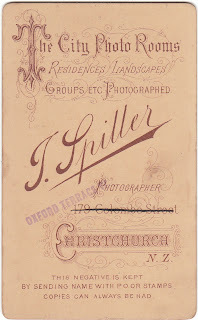 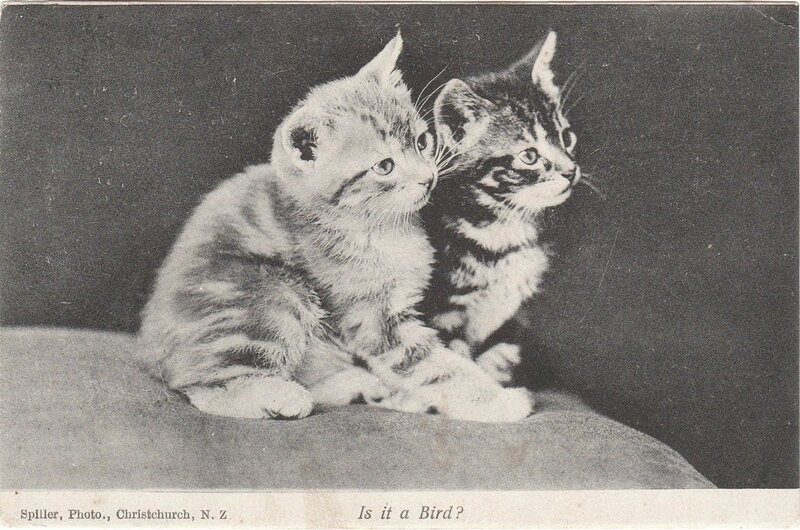 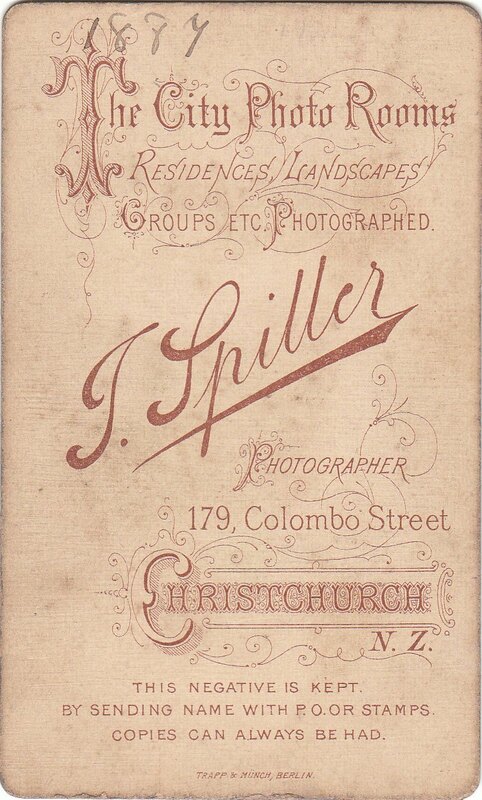 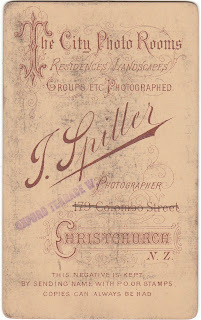 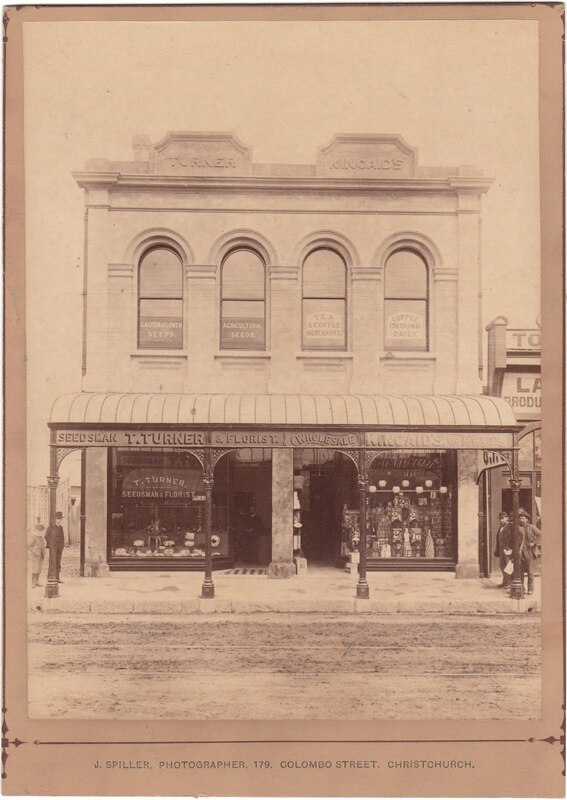 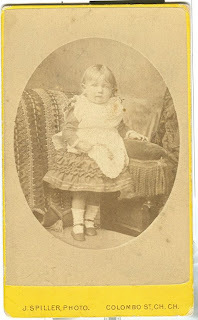 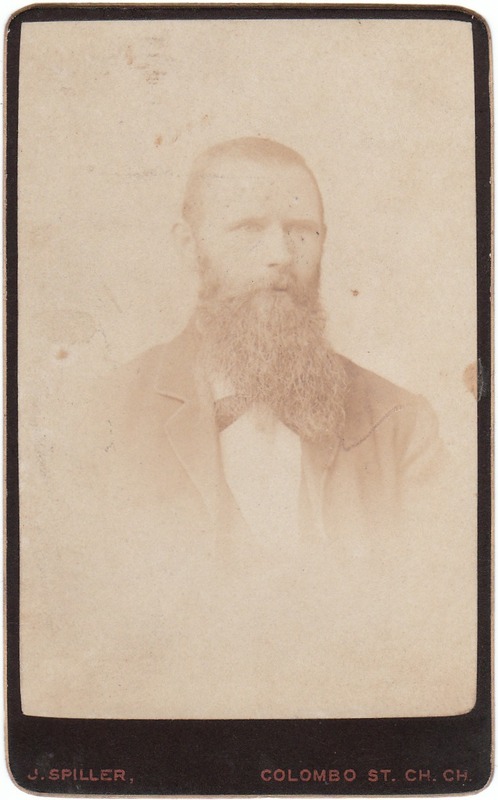 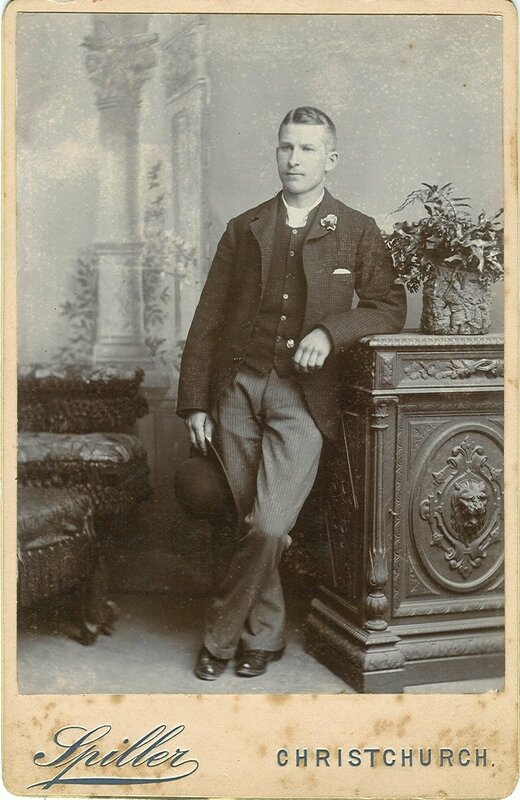 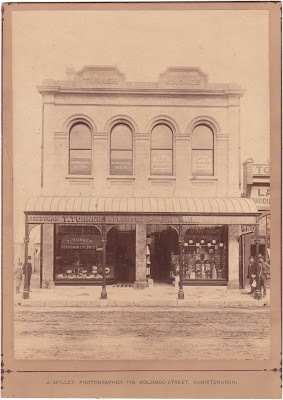 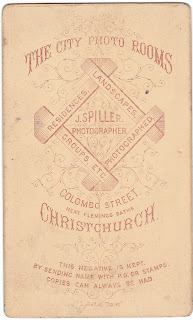 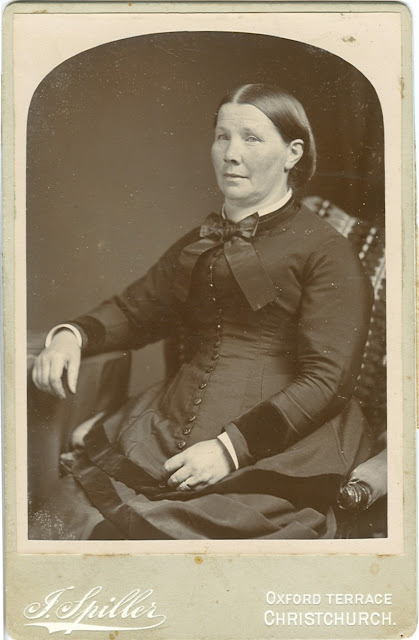 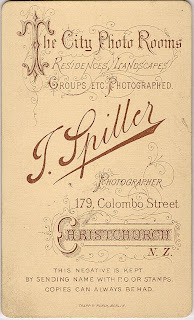 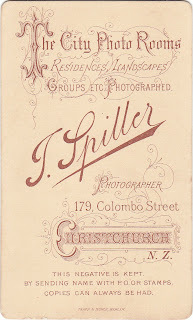 For a few years he was engaged as an assistant to the Christchurch photographer Nelson King Cherrill, but entered into business as a photographer on his own account in 1880. 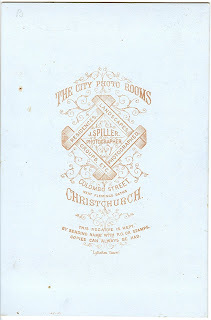 For nine years he occupied premises at 179 Colombo Street, opposite the City Hotel. 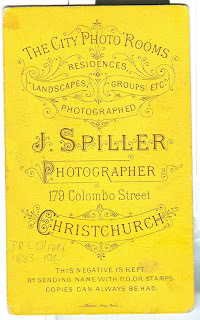 Mr W. (sic) Spiller has a valuable memento of the opening of the Lyttelton dock in the shape of another photograph of the opening, and a remarkably clear photograph too. 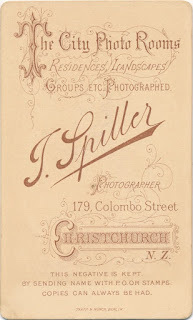 He was then in business as a photographer, over Jubal Fleming’s, where the old Starland Picture theatre was, and it was at this time that dry plates were first introduced. 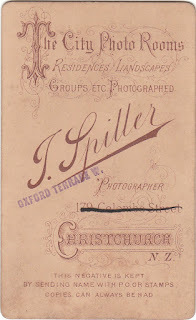 He had never used a dry plate out of doors, but he took two single slides to Lyttelton, and exposed them during the ceremony to see what the result would be. 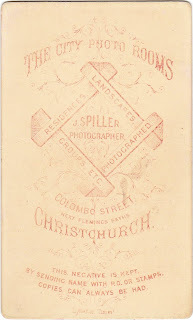 When the finished picture appeared the manager of the New Zealand Shipping Company was so pleased that he ordered as many copies as could be turned out by the following Wednesday, when the mail left for England. 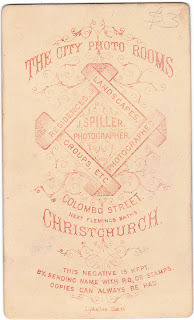 The mate also came up and ordered as many as he could get for himself and members of the crew. 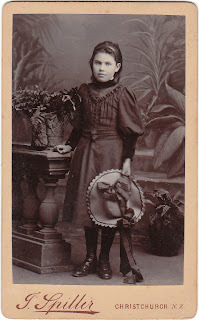 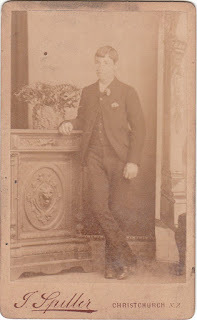 The photograph was taken as instantaneously as was possible in those days, by taking the cap off and replacing it immediately. 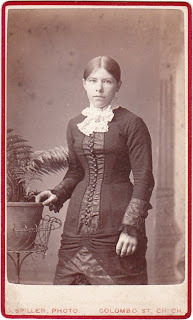 Shutters came in later years. 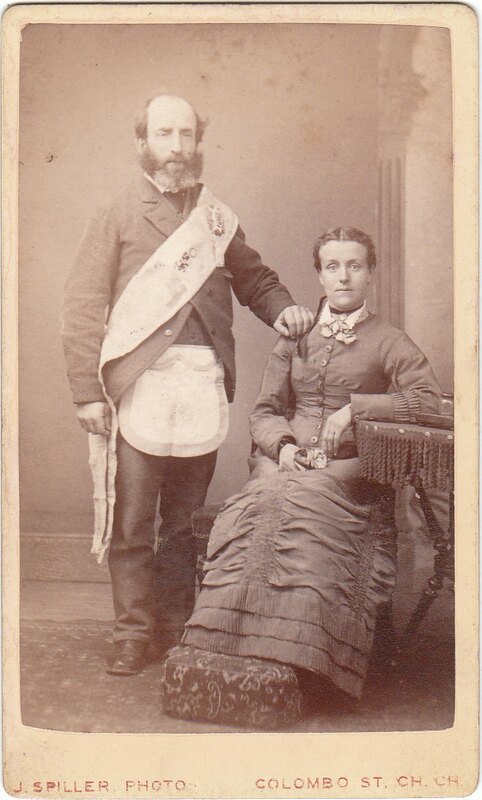 The date of the ceremony was January 3, 1883. 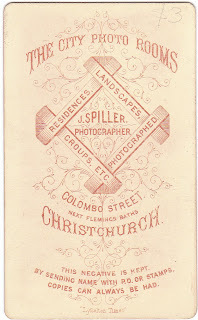 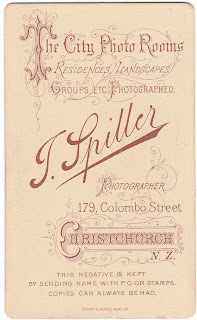 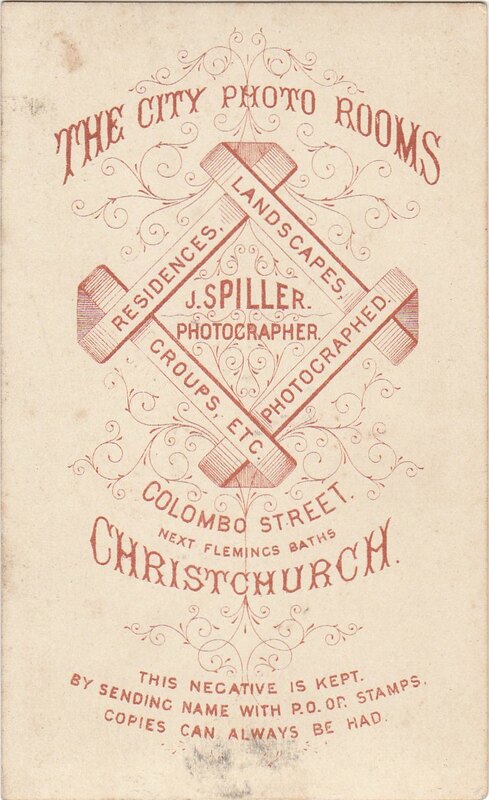 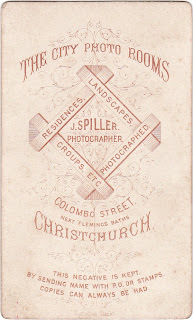 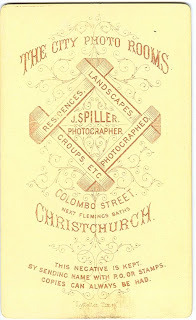 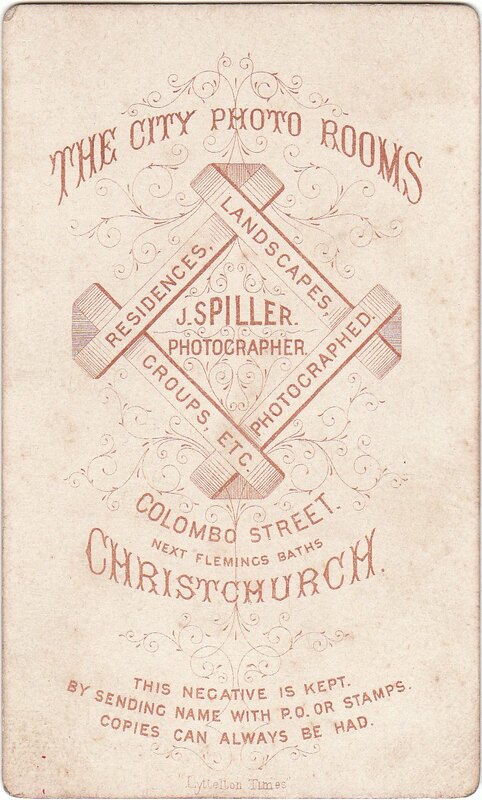 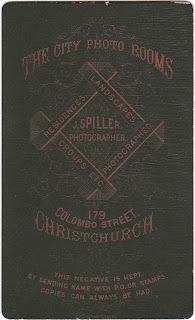 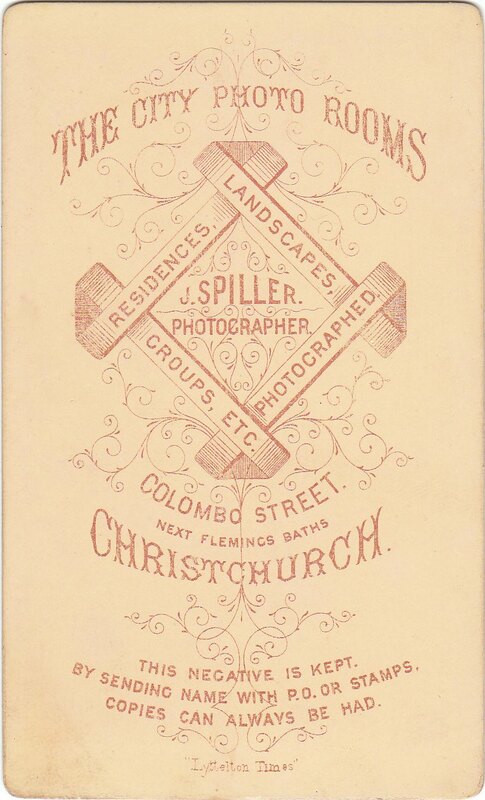 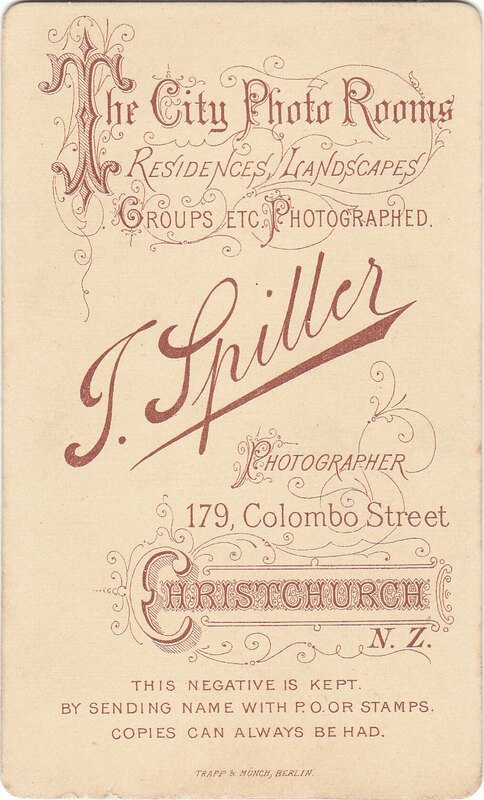 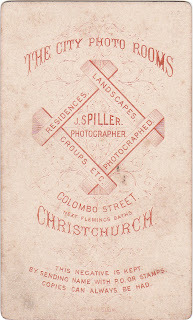 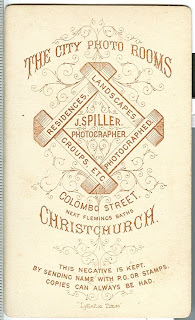 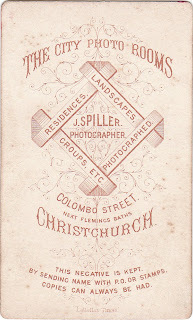 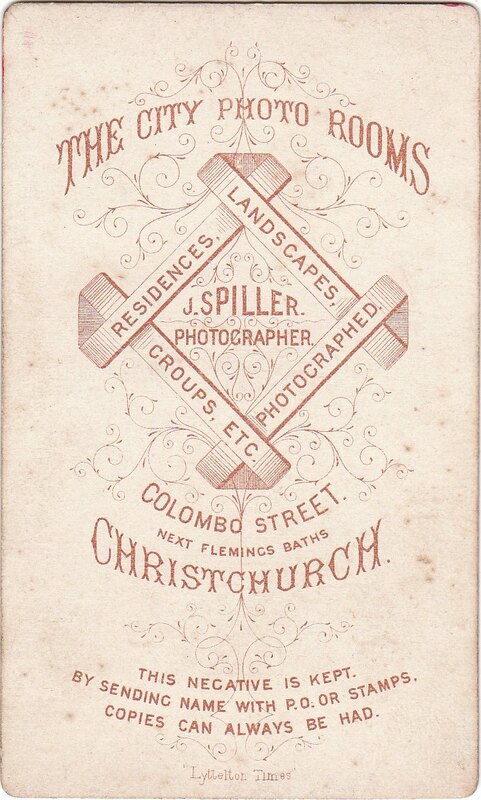 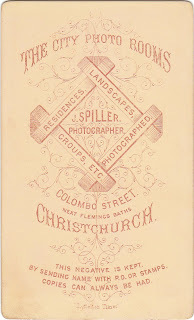 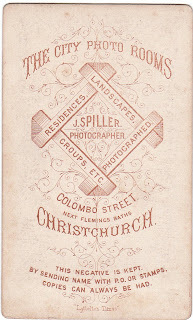 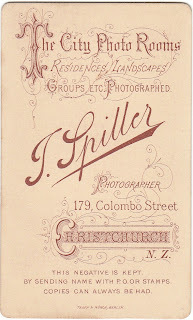 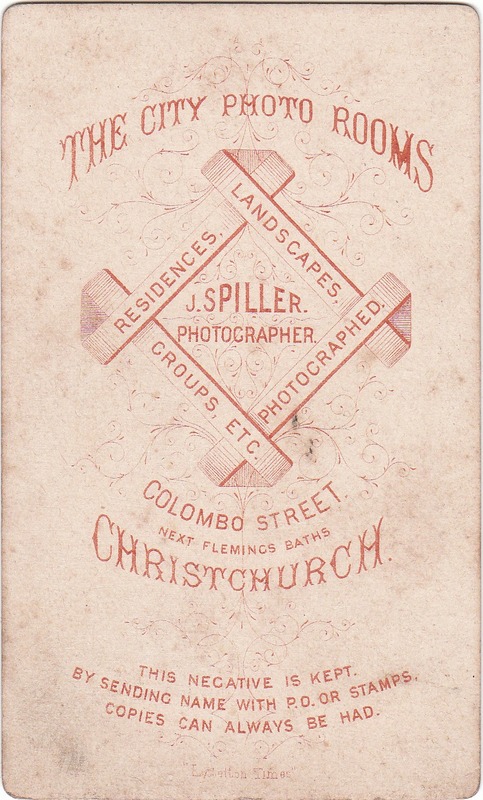 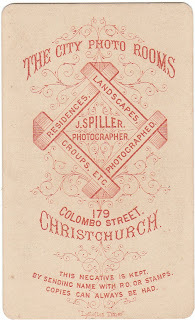 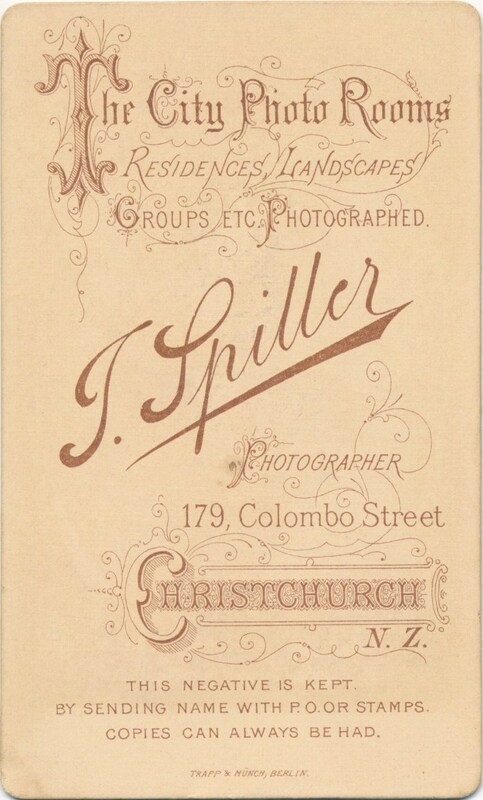 Please call on J. Spiller, 179 Colombo street, for New Zealand and South Sea Island Views. 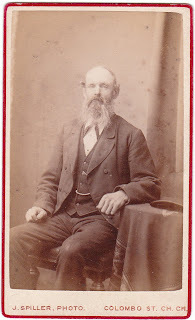 Portraits from 7s 6d dozen. 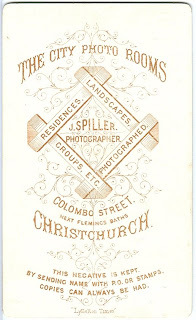 Houses, &c., photographed, town or country. 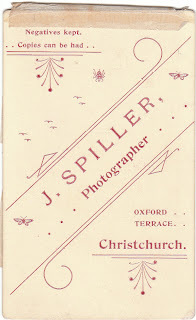 There was brought to this office today a curiosity in the shape of a double egg, that had been laid by a Buff Orpington hen, the property of Mr J. Spiller, photographer. 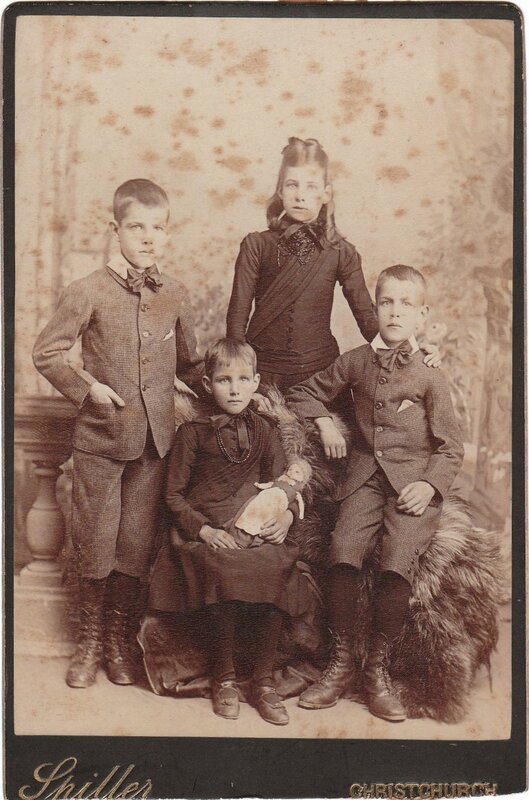 The outer egg was of phenomenal size, being over ten inches in circumference. 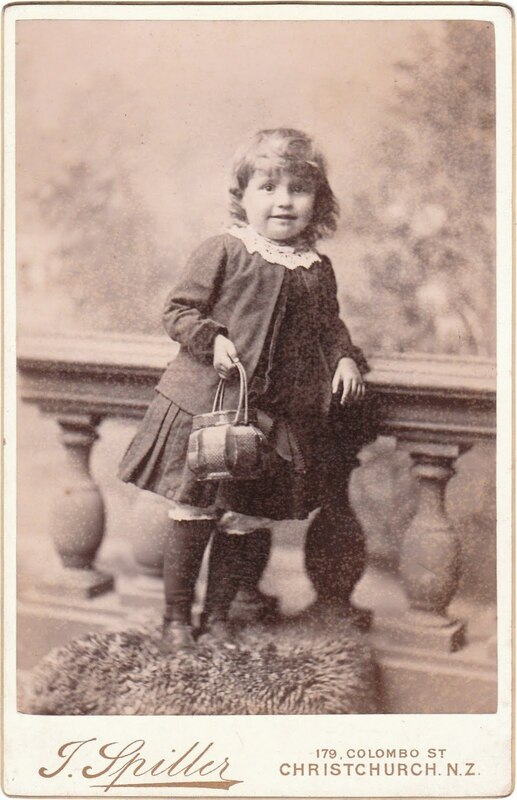 The inside egg was of the ordinary size, and in no way abnormal. 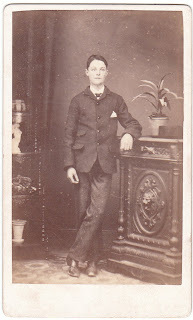 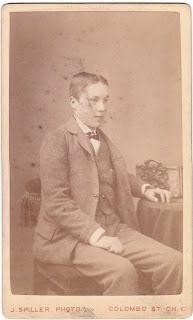 The manager of the Burnham Industrial School desires to acknowledge, with thanks, a gift of sweets from Messrs Aulsebrook and Co., a large parcel of Christmas books from Mr J. C. Prudhoe, a large packet of assorted picture postcards from Mr J. Spiller, and donations from Messrs Fletcher, Humphreys and Co. and Mr F. W. Sandlord towards the boys' Christmas treat. 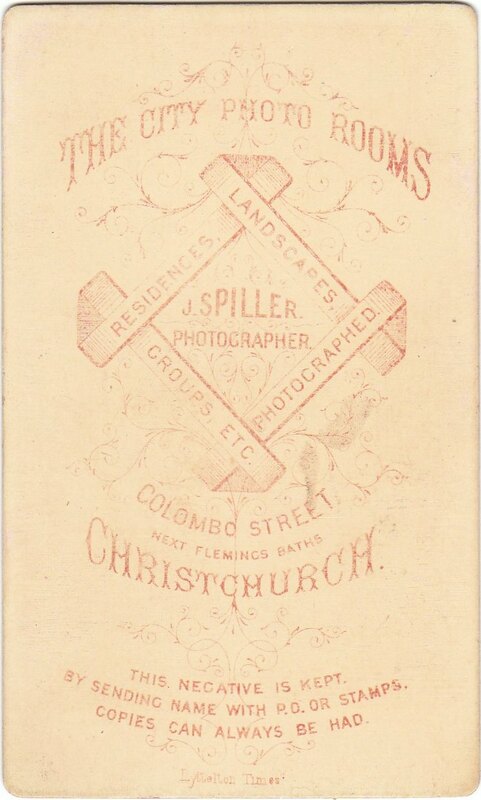 45 Ward Street, Christchurch. 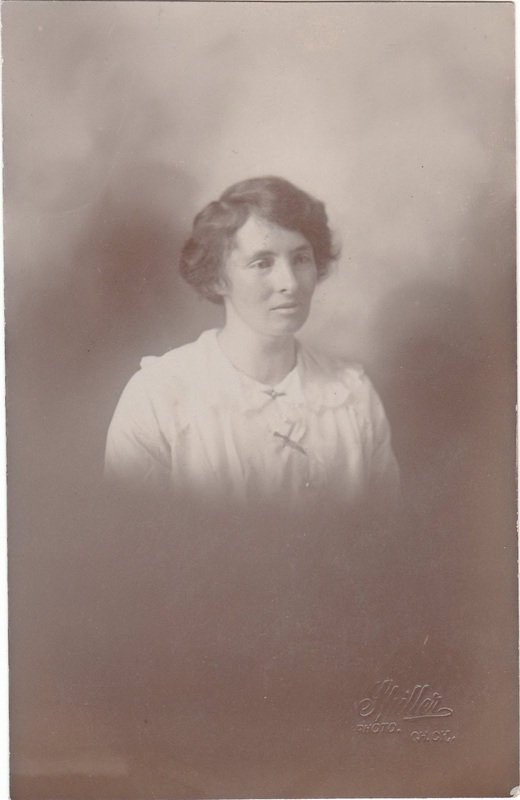 His wife died on 24 July 1933 and they are buried in Sydenham Cemetery, block 28A plot 71. 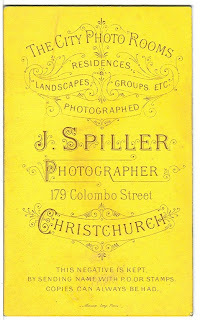 The death of well-known and respected citizen, Mr. John Spiller, took place yesterday at the Christchurch Hospital. 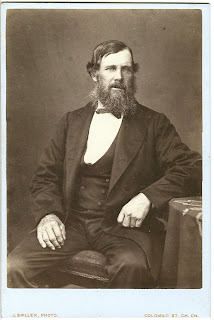 He was born at Broadway, Somerset, in 1850 and lived for some time at Exeter and later it Tunbridge Wells, Kent. 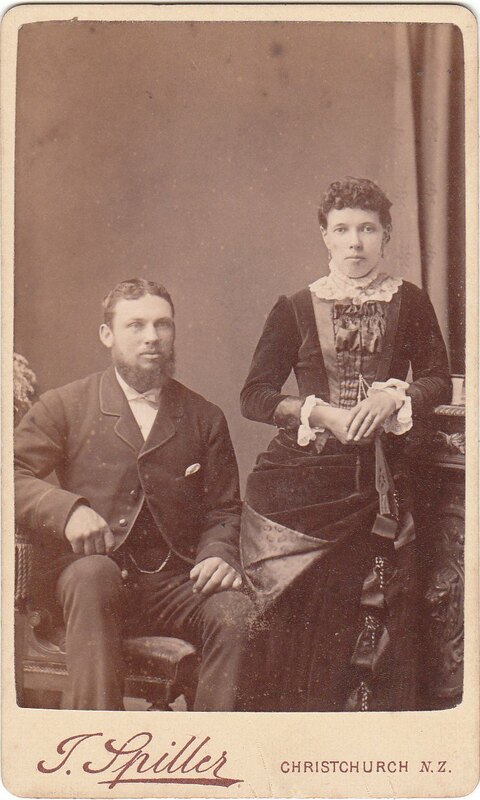 In 1876 he married a Miss Hunt, of the latter place, and shortly afterwards left with his bride for New Zealand, arriving at Lyttelton in the sailing ship Waimate on September 3rd, 1877. 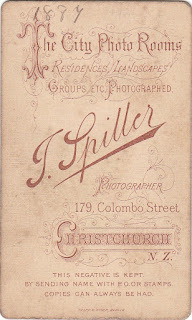 For a few years he was engaged as assistant to a Mr. Cherrill, but entered into business as a photographer on his own account in 1880. 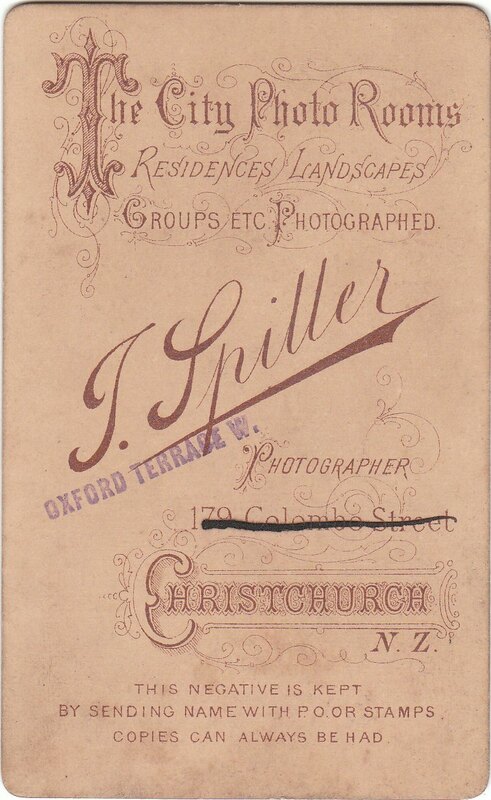 For nine years be occupied premises in Colombo street (opposite the City Hotel), and then removed to Oxford terrace, where he continued to carry on his profession until his retirement in 1920. 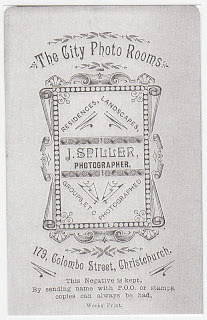 Mr. Spiller took a keen interest in public affairs, and was a prominent member of several bodies. 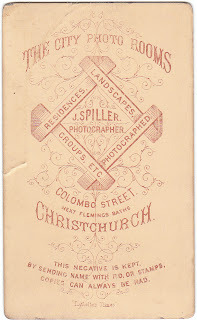 He was a member of the Canterbury Chess Club for nearly thirty years, being president; during the International Chess Congress held in Christchurch in 1906-07. 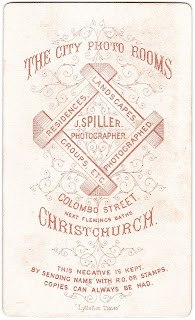 He was a member of the committee of the club for twenty years, and was made a life member in 1915. 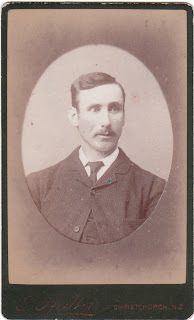 A member of the Addington School Committee for many years, he occupied the position of chairman in 1904. 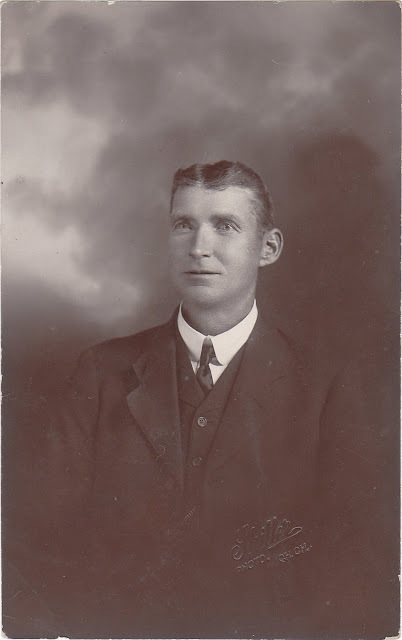 He was also a member of the executive of the School Committees’ Association, being its president in 1905, and when he resigned from the Association he was elected a life member. 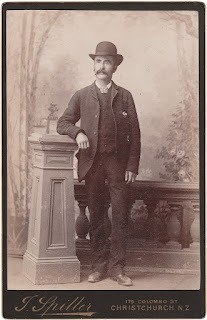 He was one of the original members of the Sydenham Bowling Club when that body was founded in l899, and was for many years on the committee and was president in 1909. In 1922 he was elected a life member. 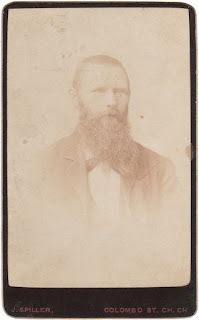 In addition to being on the committee of the Society for the Prevention of Cruelty to Animals fox a great number of years, he was for some time member of the Philosophical Institute and also of the Industrial Association. 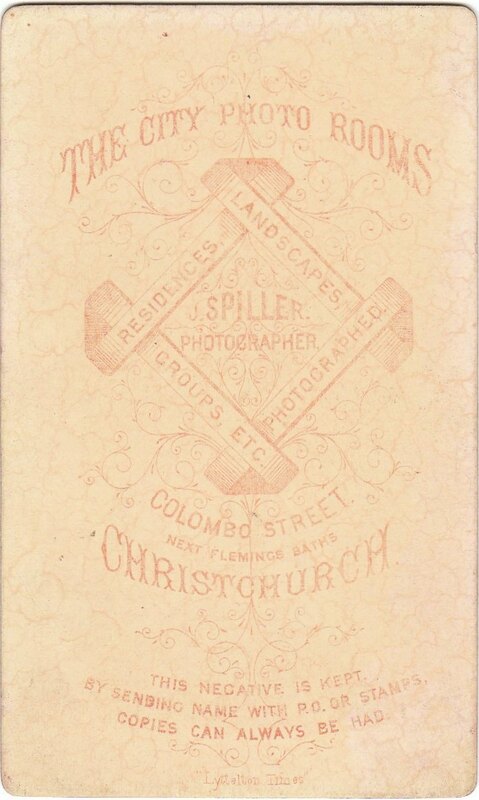 He leaves a widow and four sons—Harry, of Christchurch, Walter, of Auckland, Bertram, of London and Leonard, of Wellington - to mourn their loss. 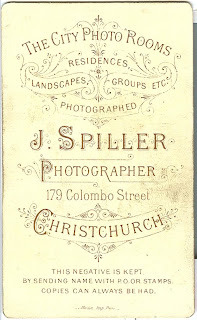 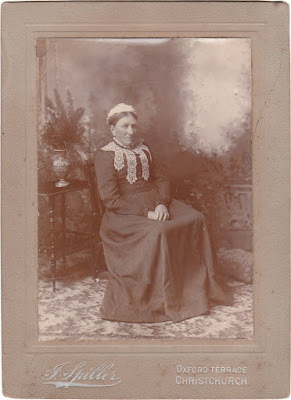 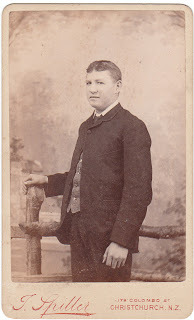 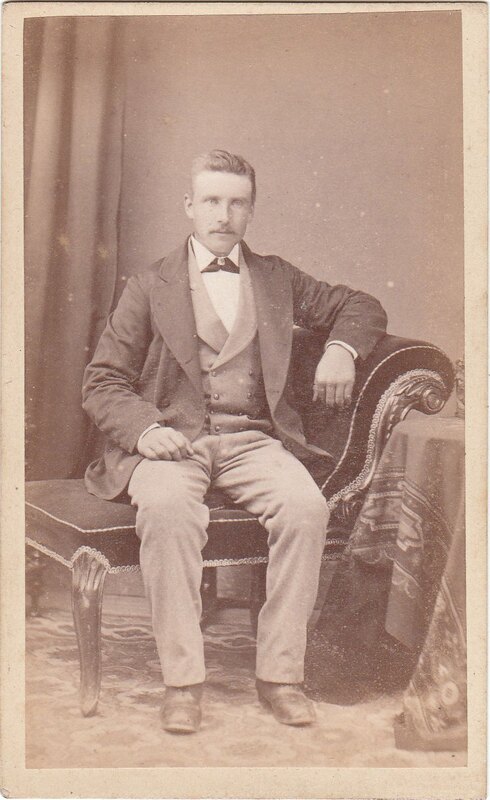 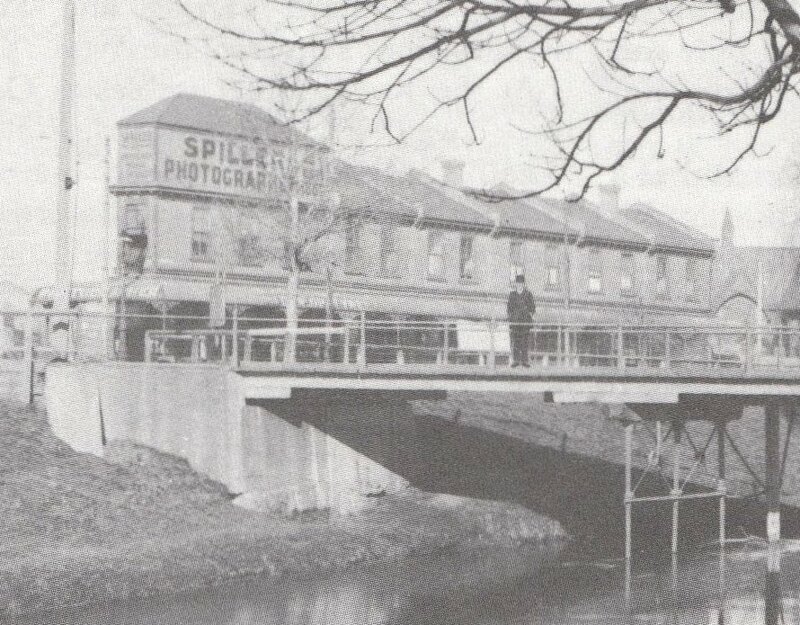 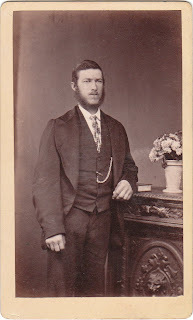 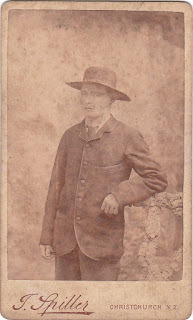 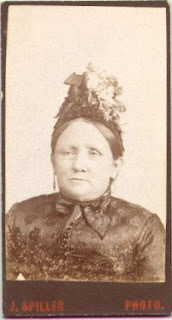 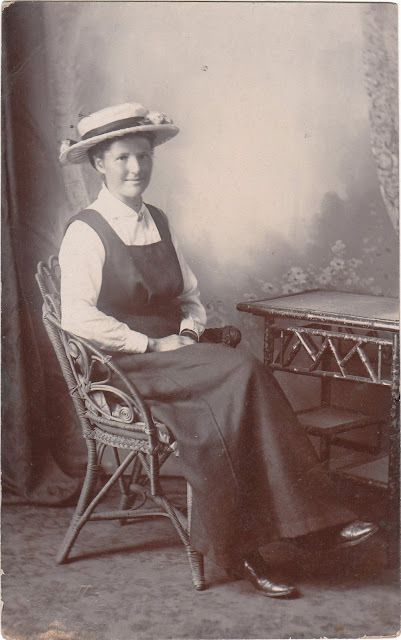 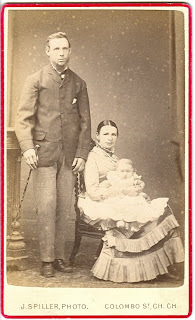 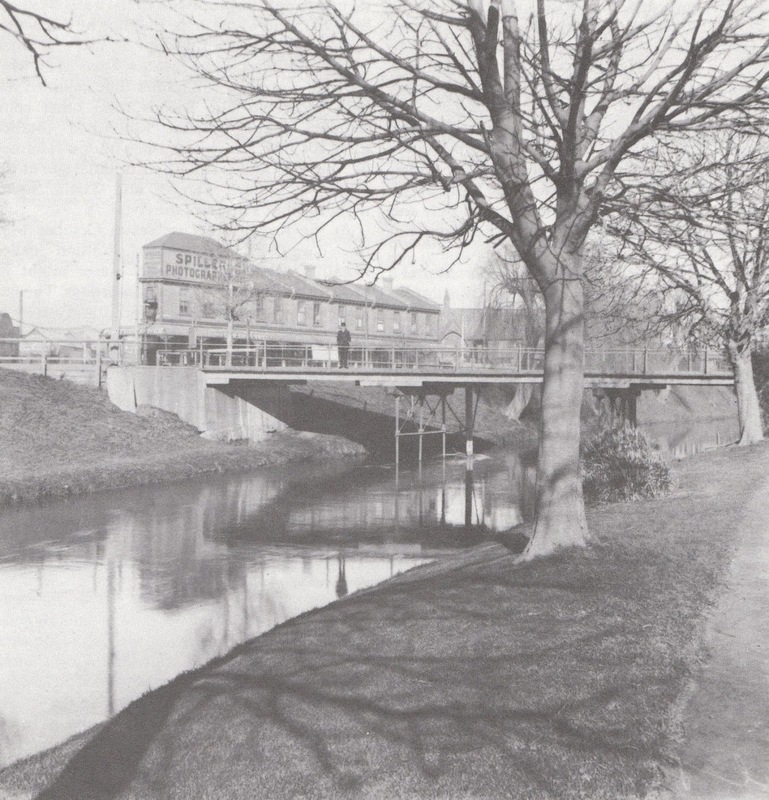 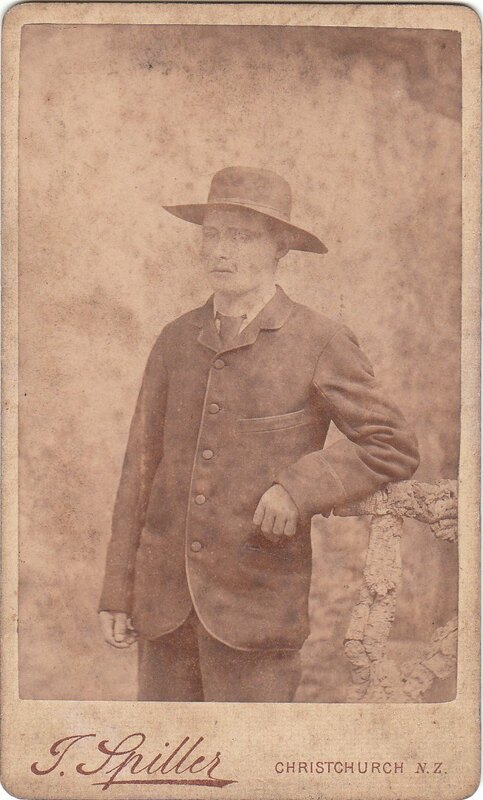 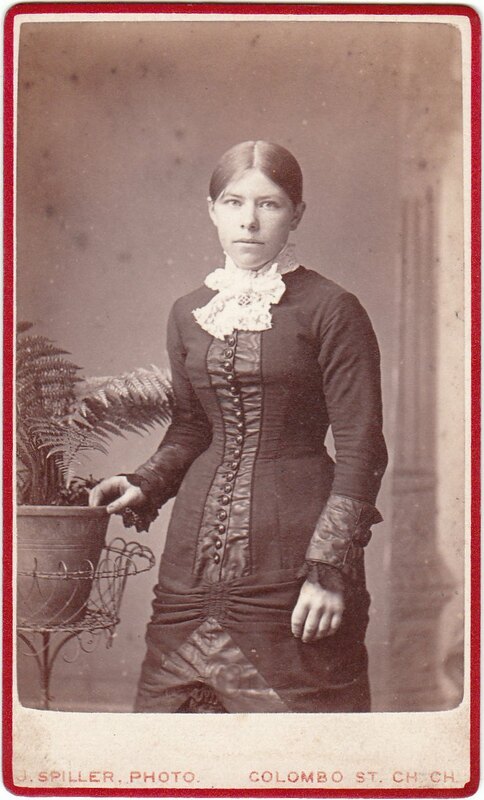 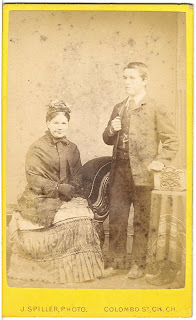 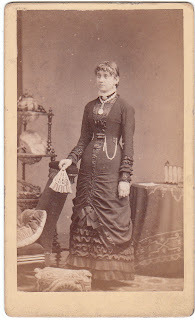 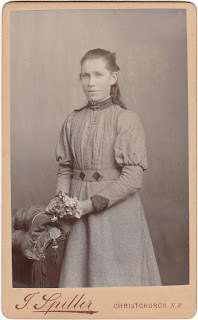 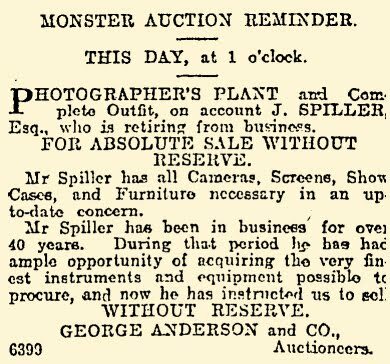 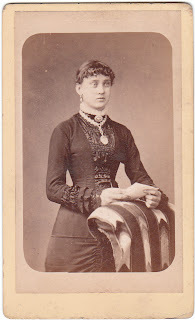 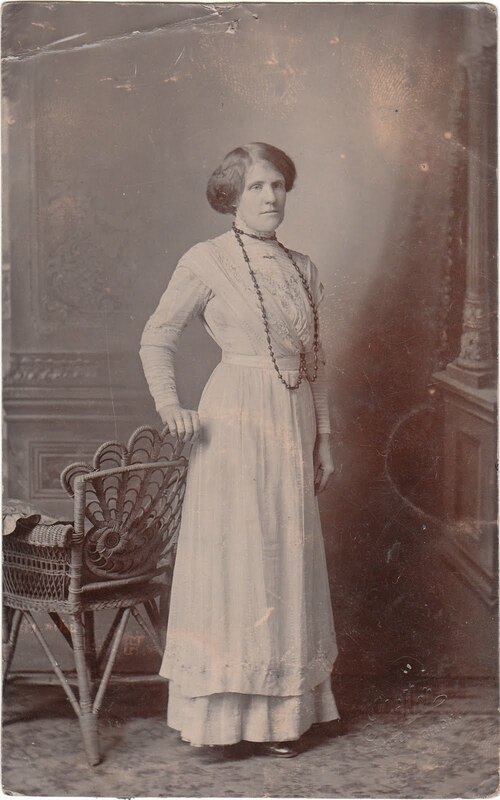 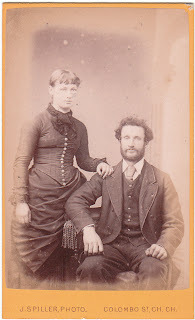 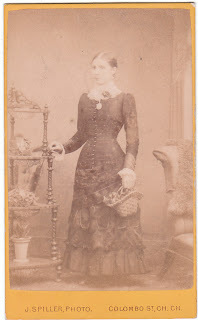 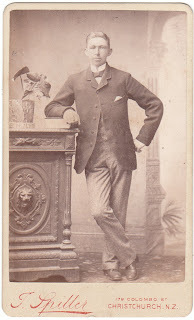 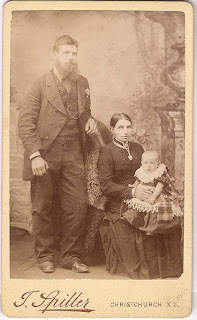 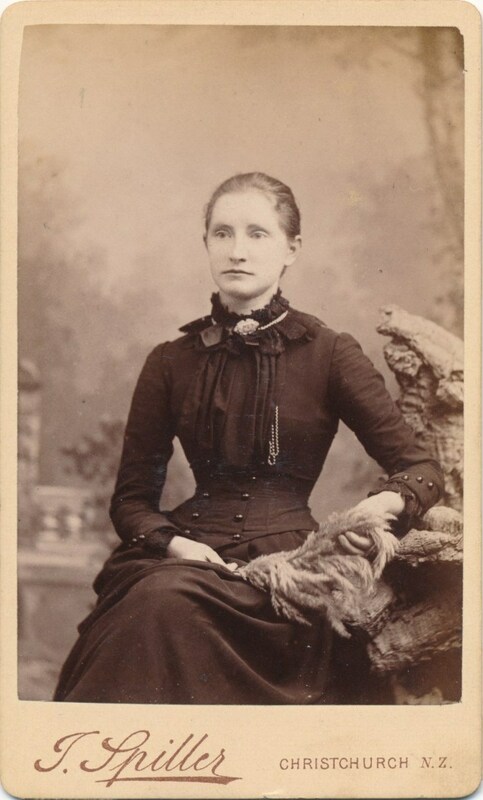 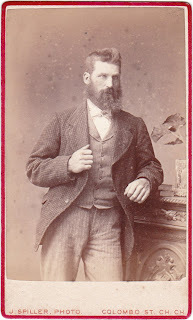 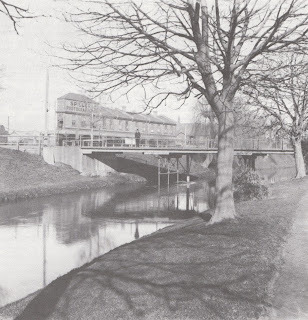 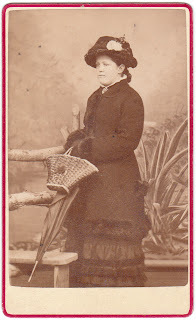 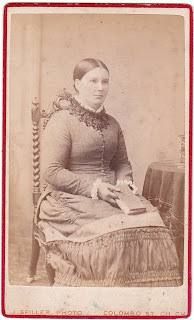 In 1887 John Spiller of Ward Street, Addington, photographer, witnessed the marriage of Harriet Emily Spiller the daughter of Samuel Spiller a nurseryman to Robert William Metson.